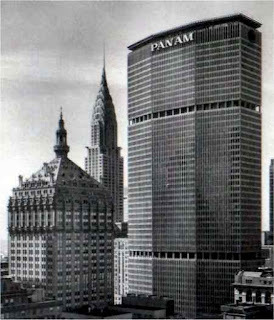 It only came across the Inside the Apple newswire late last night that yesterday was, in fact, the fiftieth birthday of the Pan Am Building (or, if you must, the Met Life Building) that stands atop Grand Central Terminal. Significant for a plethora of reasons--not least of which is that it is the only building by the Bauhaus’s Walter Gropius in the city--it has long been the building that New Yorkers love to hate. Or simply hate. The Pan Am tower came into being in the mid 1950s. As America’s transportation needs shifted from railroads to automobiles and airplanes, the owners of Grand Central Terminal and the surrounding Terminal City needed to find ways to increase revenue. After rejecting plans for a skyscraper that would have required demolishing the station, developer Erwin Wolfson proposed a three million-square-foot tower to stand between the terminal and the railroad’s headquarters, the 1929 New York Central Building. In 1958, Emery Roth & Sons submitted designs for a slender tower for that spot in keeping with their other Park Avenue skyscrapers, such as the Uris and Colgate-Palmolive buildings. Wolfson, fearing this new tower lacked architectural panache, brought in Gropius and Pietro Belluschi to enliven the 49-story building. * Gropius and Belluschi changed the building's massing, created its unusual octagonal shape, and, most noticeably, shifted its axis so that it stood completely blocking views up or down Park Avenue. When the building opened on March 7, 1963, it had more interior square footage than any office building in the world. Twenty-five percent of those offices were leased to the building’s name tenant, Pan American airlines, which also installed a helicopter landing pad on the roof. This allowed commuters to land at any of the area’s major airports and be whisked to the heart of Manhattan. Due to construction delays and lack of public support, the helipad did not open until 1965 and then was only used for three years. After nearly a decade, it reopened in 1977; on May 17 of that year, the landing gear on a helicopter failed just after it had touched down on the roof of the building. The resulting accident killed five people and closed the helipad for good. The building was derided from its opening. Then New York Times architecture critic Ada Louise Huxtable famously called it, "gigantically second-rate." 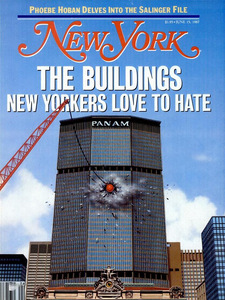 In 1987, New York magazine conducted a poll of New York City leaders to discover what was the worst building in the city. Pan Am topped the list. 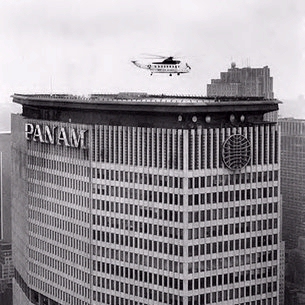 In 1991, the airline--which was already on life support and occupied only a fraction of its original office space--left the building, and the skyscraper's owners, the Metropolitan Life Insurance company, replaced the iconic Pan Am logo with their own. Though that logo remains, Met Life sold the building in 2005 for a record $1.72 billion to a consortium headed by Tishman Speyer, but which also includes the New York City Employees' Retirement System and the Teachers' Retirement System. So, if you are in midtown today, instead of raising your fist at the shadows cast on Park Avenue, raise a glass instead to this monument to modernity. * Pan Am stands 808 feet tall -- approximately 59 stories -- but the bottom ten stories don't exist in order for it to float over Terminal City.